So I was casually flipping through a Philadelphia Magazine this evening (for the first time), and it turns out that they have an insert of Philadelphia Home Magazine. 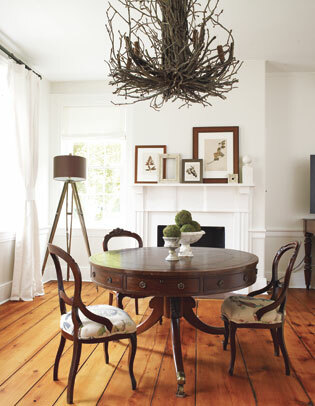 Intrigued, I flipped further and almost dropped the magazine when I came across Meg Newell’s Bucks County, PA home. One of the owner/operator/founders of Trove, a trio of women who sell a collection of vintage furniture and finds at locations such as the Brooklyn Flea, Newell’s business is an extension of her home–and I think its fabulous. Even from the street Newel’s 18th and 19th century Georgian home is a gem, but its what inside that really counts. One of the trademarks of Trove Decor is that they often bring new life to old furniture by painting it and re-upholstering it. 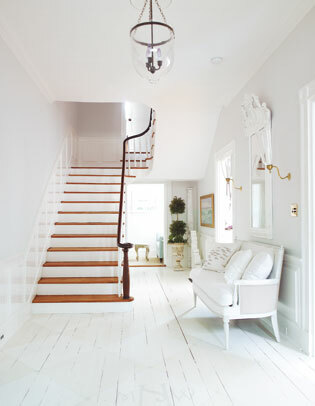 Newell’s passion for white paint is certainly apparent in her clean, crisp, refreshingly modern and yet obviously historical foyer. We all know what I love about this! Newell has combined antiques upholstered in clean linens with the waterfall table from cb2, which was a fixture of my apartment in NYC. I love the look of the waterfall table agains the heart of pine flooring. And how about those drapes? Again, no rugs, just beautiful wide plank heart of pine floors. Love it. I love the collection of prints on the mantlepiece, and the the seriousness of the dining room table and victorian chairs when paired with that amazing chandelier! And again, the walls are clean, crisp and white. At another round table, this time painted white, Newell mismatches painted chairs and uses flowers for color in the room. 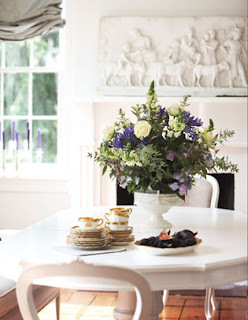 Flowers and throw pillows … literally you can decorate with only those things for color and live in a white house! Look at how fabulous this all is. According to the article, Newell’s kitchen is from Lowe’s, the kitchen table is an antique, and the chairs are ikea! 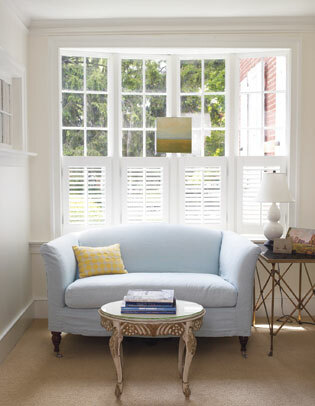 I love how Newell has hung a painting on the window mullion–a great tactic. 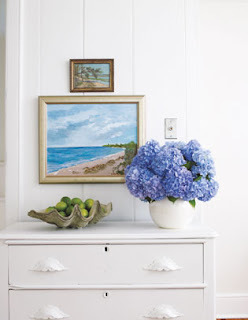 And don’t you just love the hit of blue with all the white? Ahhhhmazing. Les Indiennes, my favorite. Need I say more? Simple and chic. 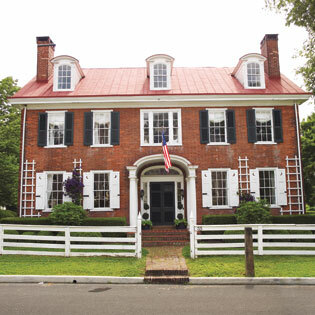 Although encasing a house in white is not typical of houses of the time period, it seems to suit this house perfectly. 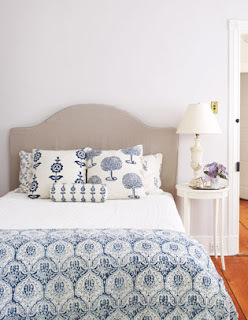 Although she painted the entirety of the house white, giving it a modern feel, the injection of vintage pieces from Trove really reflected the historic quality and character of the house. 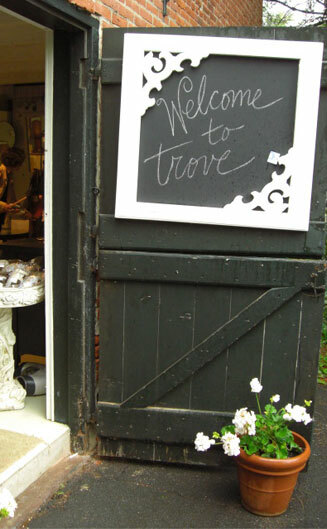 Of course this means that now I will be stalking Trove Decor’s website, and waiting for their famous barn sales out in Bucks County. I am so thrilled to have found these ladies, and as someone who enjoys a good paint job, these fabulous women are right after my own heart. Wow this all looks so fabulous. I love all the white. It doesn’t look ‘Swedish’ but interesting and personal. Let me know next time Trove has a sale – I’m in the area! It’s Billy Doyle. I love your blog! Let me know if you come up to Boston anytime soon. Keep it up! Pshtttt. This is almost exaclty how I imagine YOUR home will be! Wow, what a find! pemberley!!! trove sale tomorrow and saturday in newtown, pa! !